Our goal when choosing to distribute this blender was simple. We wanted to provide a blender not just with the power and performance of a Vitamix or Blendtec, but also with the commercial build quality to match. 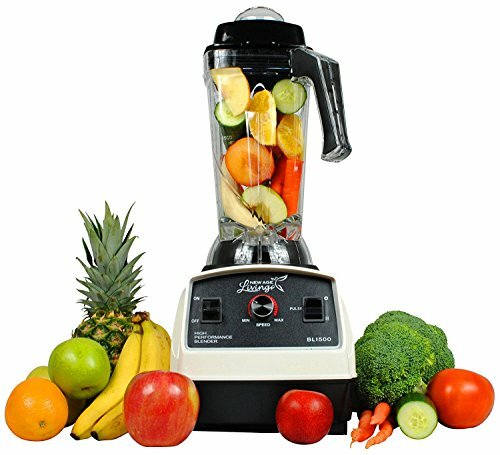 The BL1500 by New Age Living is that blender, with a 3 peak horsepower copper wound motor (capable of 35,000 RPM), a large 85 Oz BPA free Tritan Plastic jar, high grade stainless steel blades, as well as both thermal and electrical cut offs to protect the motor and electronics. Like a Vitamix it will blend perfect smoothies, and even make hot soups using the friction of the blades to heat the liquid inside. And with incredibly easy to use analog controls anyone can quickly get started making their favorite recipe. With countless of units being put to work in smoothie shops and restaurants across the USA and Canada, the 5 year warranty is a direct reflection of our confidence in the quality of these blenders. You no longer need to pay high distributor and retail markups to get a quality commercial blender that will serve you and your customers for years to come. OVERSTOCKED: We are passing our new volume discount on to you! Buy now and save. SAFE: The blending jar uses nearly indestructable baby bottle grade BPA free Tritan plastic. ETL RATING & 5 YEAR WARRANTY: Complete ETL electrical rating for safe use in the USA along with full warranty.